Well, after last night's bear scare I didn't get to sleep until just after midnight--and I woke up at 5:30 with the bright sunlight. 5 hours sleep, good enough for me, right? Sure. I got up and got on the trail, startling another thru-hiker listening to his iPod. Bears aren't the only scary things in the woods; marmots count too! 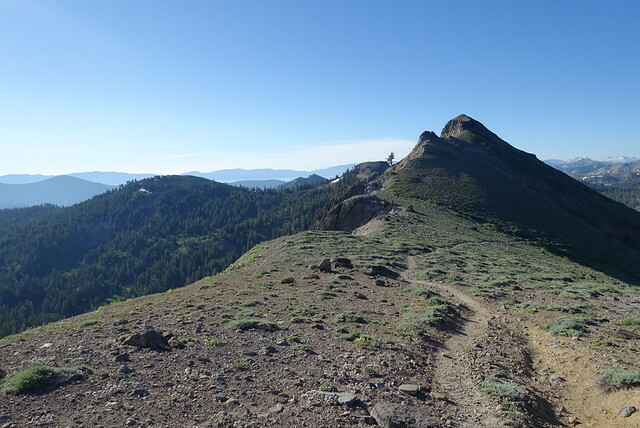 The trail wound up and over the east shoulder of Tinker's Knob, a 9000' volcanic plug, and the scenery opened up immensely--views to the north of various ski operations, to the east towards Truckee, towards Sacramento to the west, complete with a little scrim of smog. 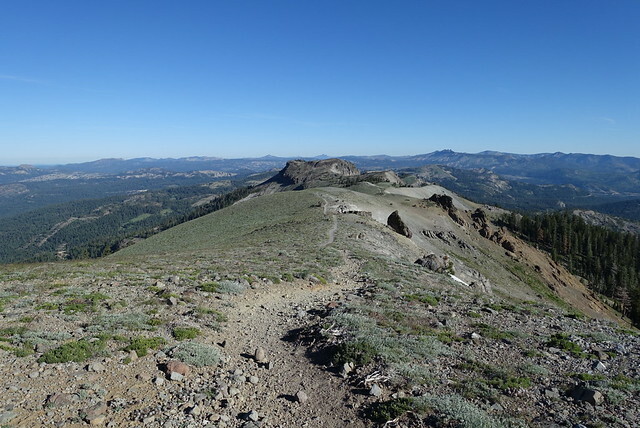 The trail kept right along the ridge, cresting for about a mile, reminding me a bit of a few walks above treeline in New Zealand... then the trail came down off the ridge and I realized how this part of the Sierra is put together: a granite layer below, with a cap of volcanic rock that's mostly eroded. 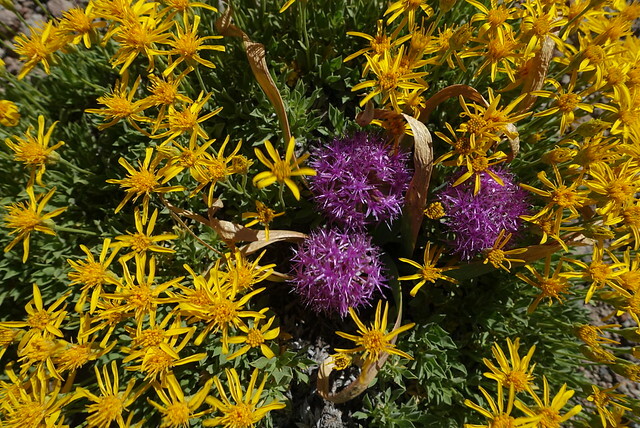 Now I get it--all those odd transitions from granite (hard hiking, lots of boulders and rocks and steps and mud and pooled water) to volcanic (easy hiking, smooth trails, good drainage and views). I just kept going and going along the ridge, really enjoying the view. 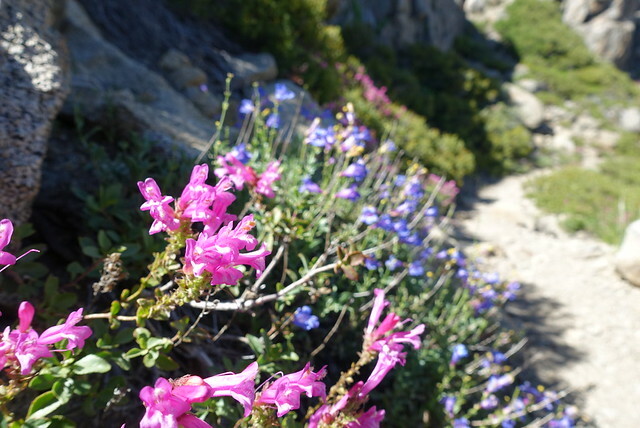 About 3 or 4 miles south of Donner Pass I started to encounter a few trail runners, and the closer I got the more people were out and about enjoying the wonderful weather and the wildflowers. One of them stopped me and asked me if I was hiking to Canada. Yes, I replied! She was super-interested in everything, and (without me asking!) asked if I wanted a ride into Truckee for "a burger or something". Sure I would--how can I turn down a ride like that, especially after I was craving a burger for the past three days. So Maureen happily drove me down the hill to Burger Me, where I enjoyed the 1/3 pound buffalo burger with swiss and avocado and mushroom, four or five refills of Sierra Mist, and a pint of Sierra Nevada Pale Ale on tap. It was very Sierra-y all around. I wanted to see just a little bit of Truckee--founded in 1863 when the railroad from "back East" came through on its way to the gold fields--so I wandered down the main drag, oddly one-sided, with buildings facing the railroad tracks. Back in the day the storefronts were no doubt occupied by all those Old West establishments, saloons and dry goods merchants and wink wink the house with the refined ladies. Now the storefronts were organic ice cream and fancy jewelry stores and a few art galleries and miscellaneous boutiquey things. I did see a barber pole, so I went up and got a nice cleanup by Ron, who was sporting an awesome flattop. That almost inspired me to get a flattop, but what's the point when I'm wearing hats all day? I just settled for the usual, with a stache trim so I don't smell my dinner all night long. After the haircut, a short walk to Safeway (anything under 2 miles is now short!) where I was good and did not buy too much fruit. I ate an orange out front and downed a Squirt and took a Gatorade Grape with me for the trail (and it'll become my dirty water collector bottle). 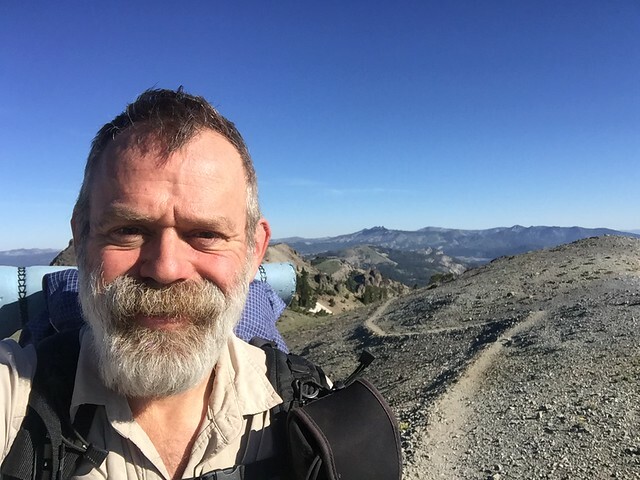 I didn't find a ride back to the trail, so I walked to the western edge of town near Donner State Park and got a ride from the 18th car that passed--a rock climber heading up to the boulders just below the PCT at Donner Pass. I really did debate hitchiking on the onramp to I-80 and picking up the trail at the rest area (the PCT goes within 100 yards of the westbound rest area) but thought that was just a bit... inelegant. I may not be a purist, but I am a completist. Back on the trail after a Burger Me burger in Truckee! 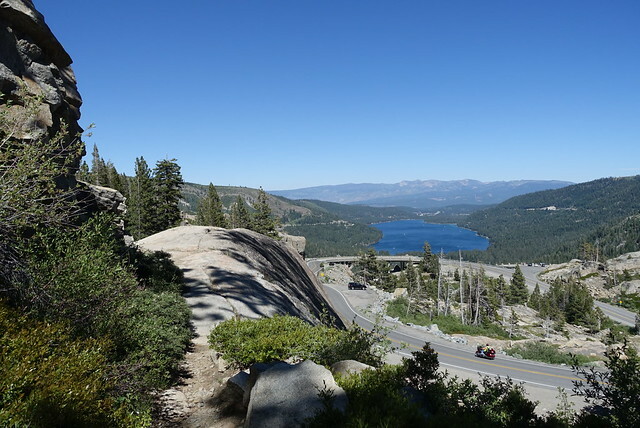 The four miles from Donner Pass to Donner Summit (and I-80, yes the names are confusing) was easy, with a fair number of tourists out looking for this lake or that. 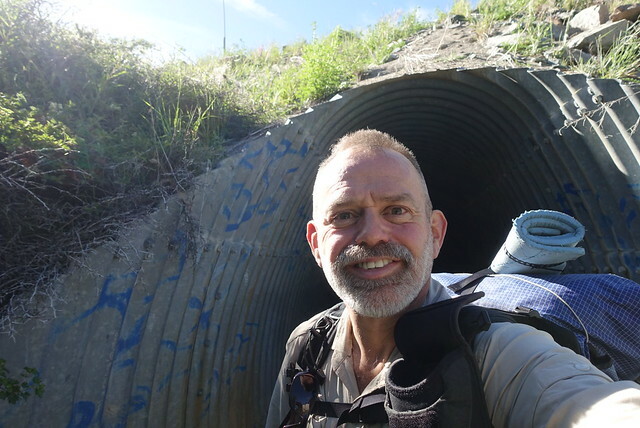 I scooted through the two culverts that took the PCT under the Interstate, then shuffled along north of the rest area, thinking I might just go up and over Castle Pass and find a place to stay. 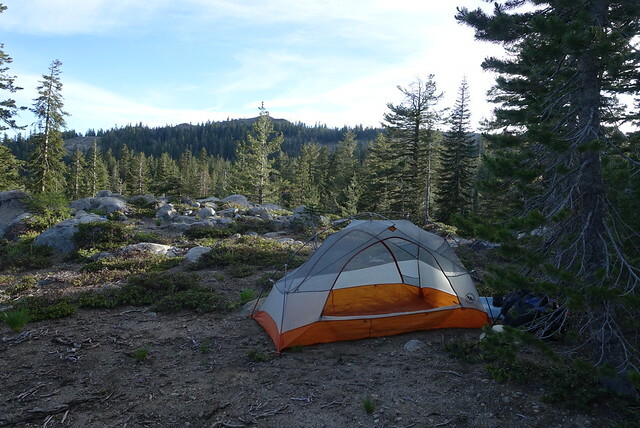 But then I saw this nice open space with granite rocks to sit on, flat spaces for the tent, and manzanita. That all means "it's dry, no mosquitos" and I called it an early night. I did watch Chris's plane fly nearly overhead which was fun; he's on his way to Seattle. 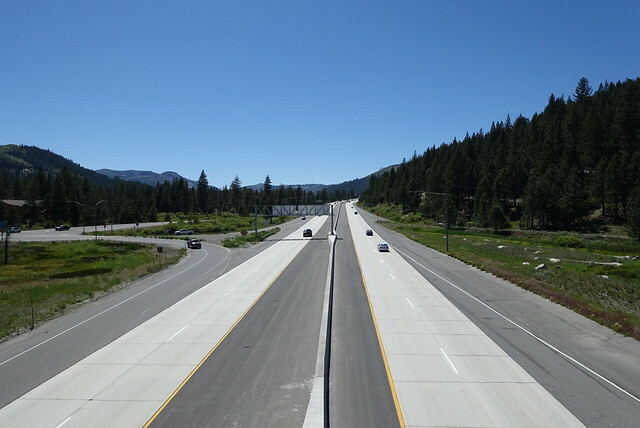 From here, it's 36 miles to Sierra City. That's two easy days of walking, though a lot is downhill. Sierra City is at 4000 feet, and I don't think the PCT has been that low since somewhere near Tehachapi, hundreds of miles south. Out of Sierra City the PCT does an awful 3500 foot climb in just a few miles, hot and sunny, and I'm aiming to do that on Monday morning. 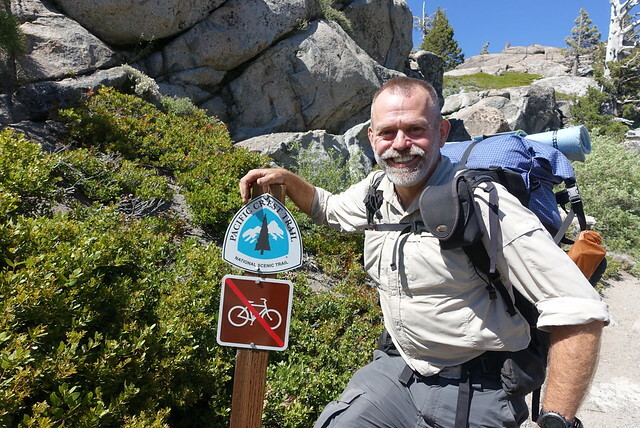 Then some rambling through that unknown part of the Sierra, burgers and shakes at Buck's Lake Lodge on the way, and maybe a real actual zero (rest) day in Chester. That's what I'm thinking now.